Review of Westvleteren XII | Beer Apprentice - Craft Beer News, Reviews, Interviews and Info. Hello everyone. Thanks for checking in. For today’s craft beer review I’m going to be trying the Westvleteren XII produced by the Sint-Sixtusabdij located in Westvleteren, Belgium.As you guys know. This is a very special beer. Not that all craft beers aren’t special in their own way, but to get the opportunity to try the Westvleteren XII makes this a very exciting day for me. The back story of this brew has been told time and time again, so let’s not waste time with a bunch of small talk. The website, www.sintsixtus.be, provided some info about the brewery, however it didn’t divulge any secrets about the beer. Heck with it. I can’t wait. Let’s pour this thing!!! This brew comes in an 11.2 oz. bottle with an ABV of 10.2%. It poured a beautifully deep and rich, burgundy/brown color. The tan crown was sized decently well with a very, very easy pour. It developed a creamy and smooth texture that held its shape for a solid length of time. The lacing was delightfully thick and sticky for the first half of the beer. It eventually dissipated to reveal some clear alcohol on the sides of the matching Trappist glass when tilted from side to side. The nose was magnificent. Dark fruits abound in the form of plums, figs, dates and raisins. Tons of that Belgian yeast poked through to conjure up memories of freshly baked Amish bread. A little bit of caramel was discovered as well as some spicy clove. Some sugary aspects started to stand out as it warmed too. I’m not sure if that was from the caramel or if it was a completely separate thing altogether Either way, this brew had a spectacular nose. So well balanced and polished. The flavor was more of the same. Rich, sweet, sticky, dark fruits combined with that smooth and creamy Belgian yeast and bread. The spicy clove was accountant for again as well, however this time it was accompanied by just a tad bit of leather and a touch of booze. I guess that was to be expected to some degree with the 10.2% ABV involved. Still though, it was a great tasting brew. The mouthfeel was medium bodied. Dry, creamy, soft and chewy. The carbonation was dang near perfect. It was in no way fizzy or flat. It sat right in the middle. It was one of, if not the softest finishes I’ve ever experienced. Almost like velvety chocolate or something. A small amount of warmth was felt and an excellent amount of flavor was left behind after each small sip. Yep. This is a great beer. It is an outstanding and world class beverage for sure. It’s got all the characteristics you’d expect from a great Belgian Quad. It’s complex and filled with character. The drinkability is quite good for a beer this high in ABV, however I was in no rush to finish it. Now, is it the greatest beer on the planet? Well, I don’t know that I personally think it’s the best beer that I’ve ever tried, but there is no doubt that it’s one of the best Quads I’ve ever had. I’ve never had the opportunity to line this beer up side by side against the St. Bernardus Abt. 12, Rochefort 10 or the Pannepot Reserva, but I think that it would be awfully difficult to try to choose between them. I mean, how could you go wrong by choosing any of those brews really? I’m fortunate enough that I snagged a “brick” of this, so maybe I could try that experiment someday. 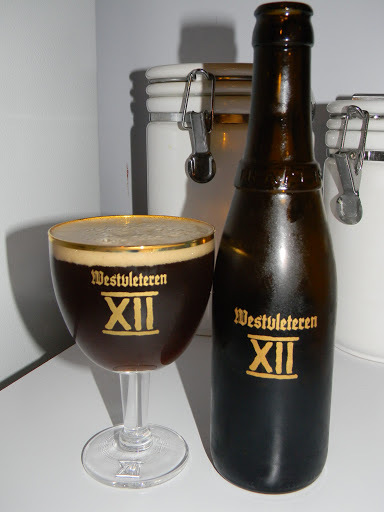 So, if you guys weren’t as lucky, but someone gives you the opportunity to try a Westvleteren XII…. jump at the chance. Not only because it’s a great beer, but also because it is such a very rare one that doesn’t come around very often. Be sure to drop me a line and let me know what you thought of it. Was it the best beer you’ve ever had? Fourth guy had Westy at 2 and St. Bernardus at 3. But all of us agreed the Rochefort 10 was easily the best of the three. For what it's worth, they were all bottled within a month of each other. The next time you have one of those tastings you better send me an invite!!! Wow!!! Seriously though, it would be like splitting hairs trying to decide which was better in my opinion. They are all spectacular. I love them all. Like I mentioned, I'm gonna have to do a little side by side tasting myself at some point so I can really pick out the subtle nuances of each of them. That's going to be a fun day. Glad you got to try this. I had it a little over a year ago and it remains one of the best beers I've ever had. I liked it more than the Rochefort, but a lot of people seem to feel the opposite way. Either way, they're both fantastic beers. It's almost like the old saying, “would you rather have a million dollars in gold or silver?”….. I think I would be happy with either.